ON OFF v. 3.0 is the final update to the exhibition project featuring new international net art online and in print, organized by Afsnit P and the print magazine Hvedekorn. 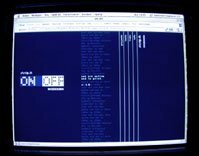 ON OFF v. 1.0 was released in December 2000, featuring projects by Mark Napier and Entropy8Zuper, and texts about net art by leading curators artists, and art historians. For v. 2.0 web artist Isabel Chang created the project CUT2Version 3.0 features a new project by Jonah Brucker-Cohen.